Yellowstone National Park is the world's first National Park, also the largest in the United States. Glacier National Park is a land of mountain ranges carved by prehistoric ice rivers. It features alpine meadows, deep forests, waterfalls, about 50 glistening glaciers and 200 sparkling lakes. Montana is known as "Big Sky Country"
Combination, Comet, Keystone, Black Pine, and Pony are names of Montana ghost towns. Montana has yielded some of the world's most significant dinosaur discoveries. The fifteen stops along the Montana Dinosaur Trail allow you to discover these paleontological treasures for yourself. 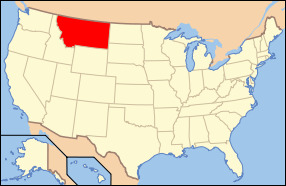 The state of Montana is located in the western region of the United States and the states western region consists of a number of mountain ranges. Smaller mountain ranges can also be found more in the central area of the state all of which makeup a total of 77 ranges of the Rocky Mountains. The states name is derived from a Spanish word “montana” which means mountain. The state has been given several different nicknames which range from “The Treasure State” to “Big Sky Country”. Montana is ranked as the 4th most extensive state with a total land area of 147,042 square miles and is the 7th ranked least populated state with a population of just 998,199 people. The capital of Montana is the city of Helena however the largest city is Billings. Montana is also well known for its Glacier National Park and the Little Bighorn Battlefield National Monument, along with three out of five of the entrances to the Yellowstone National Park, all of which attract millions of tourists each and every year. Due to the large land area and great variation in the states overall geography, the climate in the state of Montana is varied considerably. Overall however the climate in Montana has been becoming increasingly warmer and the glaciers in the Glacier National Park are predicted to actually melt completely in just a few decades. Montana's major industries mainly include farming (sugar beets and wheat), cattle ranching, oil, tourism, lumber, and mining (gold, silver, copper, and coal). The major bodies of water in the state are Yellowstone River, Clark Fork River, Missouri River, Fort Peck Lake, and Flathead Lake. The highest point of elevation is Granite Peak which sits at 12,799 feet above sea level while the lowest point is Kootenai River which is 1,800 feet above sea level. There are a total of 56 counties in the state and the state is bordered by Idaho, Wyoming, North Dakota, South Dakota, and Canada. The state bird of Montana is the Western Meadowlark, while the state fish is the Cutthroat Trout. The state animal is the Grizzly Bear, the state flower is the Bitterroot, the state tree is the Ponderosa Pine, and the state grass is the Bluebunch Wheatgrass. Montana has a relatively large land area compared to most of the other states in the country but it contains some unique geographical features within its borders making it an ideal getaway for people who enjoy open land and nature in general. Montana is a rare and special place. Our Big Sky, open land, majestic mountains and friendly people combine to make Montana the “Treasure State”. Yellowstone National Park is the world's first National Park, also the largest in the United States. Yellowstone was designated the world's first national park on March 1, 1872, with the area remaining largely in the same natural state as it was more than 123 years ago.